With renewed interest in colored gemstones taking center stage lately, we’re going to take a closer look at one of the most romantic of all the precious gemstones, the darling red ruby. Said to be one of the rarest of the big three — rubies, sapphires, and emeralds — this crimson rock is July’s birthstone, as well as the 15th and 40th anniversary stone. Named from the Latin “ruber” for red, ruby is a member of the corundum mineral family. 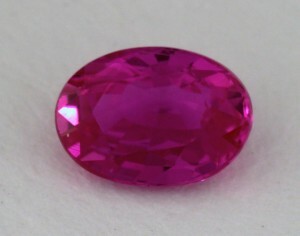 When corundum is red, we call it a ruby; when it is any other color, like blue, yellow, and pink, we call it a sapphire. Rubies are relatively hard gemstones, ranking 9 on the Mohs’ scale, only falling behind the diamond at a perfect 10. That bodes well for wearing rubies every day and not worrying about damaging the stone. If you are considering buying a ruby to be set in a ring, earrings, pendant, or other jewelry, then here’s our how-to guide of how to buy the best ruby for your money. We will go through the 4 c’s in order of their importance. As with emeralds, the most important factor when evaluating a ruby is its color. The deeper, and more intense the color, the better. Basically we measure color using three criteria: hue, tone, and saturation. Hue refers to where the ruby falls in the spectrum of other colors. Each ruby has a primary and secondary color. The primary color is red, and the secondary color is usually orange, purple, or pink. The more the ruby’s color is strictly red, the more valuable the ruby. Some rubies mined from specific locations are known to have certain secondary colors, like rubies from Myanmar that have a slight purple secondary color. Tone refers to how light or dark the shade of red is, with most good quality rubies falling somewhere between medium and medium dark tone. If the ruby’s color is too dark, then it’s difficult to make out the color, and if it’s too light than the color will be too faint. 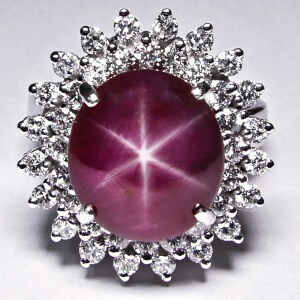 Also, if a ruby’s tone is too light, it might be considered a pink sapphire — even if the stone has high saturation. Also, rubies that fluoresce (glow in ultraviolet light) can have even greater saturation. And rutile needles, which are tiny inclusions, may improve the ruby’s color by reflecting light from inside the stone. It should go without saying that if the color of a ruby is by far the most important factor, it would be crazy to even consider buying a ruby sight unseen. This is why we only recommend buying rubies online from James Allen. Everything that works in their favor regarding diamonds is true here as well (great prices online as you’d expect, fantastic customer service, industry leading packaging, etc.). Their dominance in diamonds is even more pronounced in gemstones, as there is nobody out there who can come close to both their breadth of inventory and their elegant display of their stones. But unlike diamonds that are graded according to a strict system of letters starting with “D” and going on through alphabet, colored gemstones have no objective grading system. Gemological laboratories use master stones in order to contrast other stones’ hues, tones, and saturations. This is the only way, for example, gemologists can distinguish between pink sapphires and rubies. But it also leaves some room for error, so beware of these murky waters if someone is trying to sell you a ruby that looks a lot more to you like a pink sapphire! Clarity refers to the number, size, color, location, and quality of imperfections in the stone, known as inclusions. When gemologists measure the clarity of diamonds, they use 10x magnification to get a super-magnified view of the inside of the stone. With colored gemstones, however, gemologists do not use magnification; rather, they look for what we call “eye-cleanliness,” which means that the stone is clean or free of inclusions when viewed by the naked eye. The better the clarity, the more expensive the ruby. All natural rubies will contain some level of inclusions, also known as rutile needles or “silk.” If there are no rutile needles, gemologists will suspect the ruby has been treated, or is synthetic. Today most rubies are heat-treated to improve color and clarity, but rubies that are not and have superb quality can fetch big money at market. Interestingly enough, there is one example of inclusions actually increasing the value of the ruby. This is a rare occurrence called asterism in which three or six-point stars are visible in the stone when viewed under proper lighting. This happens when light is reflected off the rutile needles, thus creating the star effect. A ruby’s cut refers to how the stone is faceted, its dimensions, and overall symmetry. 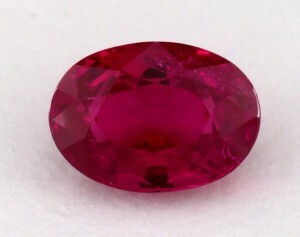 Unlike with diamonds, rubies are not graded on cut quality. The cut is much less important to consider than the ruby’s color and clarity. But as is the case with most gemstones, the true glow of the ruby is only revealed after a quality cut that maximizes light return and color. There are four factors gem cutters must keep in mind when cutting sapphires and rubies. 4. Keep in mind what shape the consumer wants, i.e., round, oval, pear, cushion, cabochon, etc. And finally, let’s consider the ruby’s carat weight. As you probably already guessed, the more carats, the bigger the price tag. Since larger gemstones are rarer than smaller gemstones, you pay more based on the laws of supply and demand. Having said that, you should also be aware that there are usually price jumps when you hit one carat, as well as three and five carats. If you want to buy a one carat ruby, consider going for a 0.9 ct. instead since most likely you will not notice the difference in size once set, but you will notice the savings in your wallet!